As you can see below, it took me a while, but I found two Signet/Insignias. The first is on the bottom of the photo. It is was a pen with a very nice cap, clean filling unit and medium nib. However, the barrel had many, many dents and dings. I have a fellow pen club member who has the tools to take these out, but he advised that if there are too many and they are deep, the lines of the cap will be compromised when the cap is reworked. So, I set the pen aside, hoping to find a mate at some point. Recently, I ran across the perfect match. The pen on the top of the photo had a close to perfect barrel (with imprint), but a cap with numerous dings and dents. I brought it home for a very low price, and proceeded to mix and match. Though not the ideal solution, and looked upon negatively by the fountain pen purist, it gave me a very nice looking Signet, and a really bad looking one. Here is the photo of the final product. 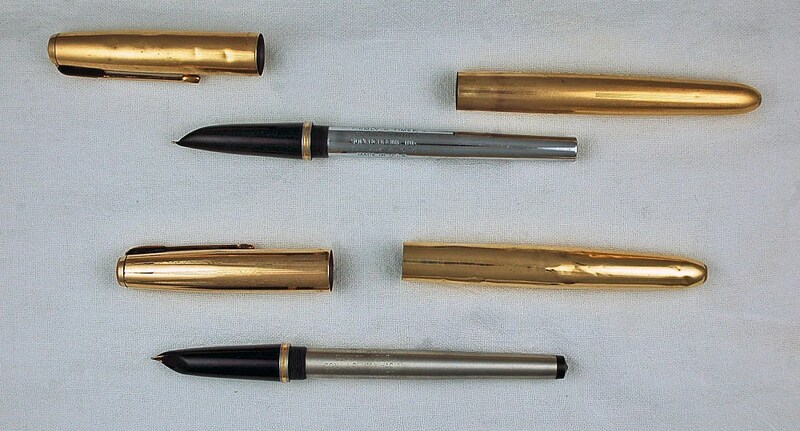 Often called a ” frankenpen” by collectors, it takes parts from two or more pens to make one. It suits my purposes, though if I ever resell it, full disclosure would be in order. The following photo shows the two created pens – the top one being a nice example of a Signet and the bottom, well…a scary example. Parker also came out with a silver model – the Flighter – at the same time. Here are the Signet/Insignia and a Flighter from my collection. The imprint on the barrel – Meta D. O’Connell. Not much information exists on Meta herself, but she was born into a famous Boston family and was the sister of Lenahan O’Connell. Perhaps this pen was used by Meta to “write the words down” as insisted by her father. In any event, I find it is always interesting to search for the names that I find imprinted on pens from time to time. You never know what you may learn. In this example, I was able to follow a story that included a famous Boston legal and political family, including brushes with John Kennedy and Teddy Roosevelt. I am not an advocate of mixing and matching pen components to create new pens, especially if you can preserve the original pen and parts, but in this example, as long as it is disclosed at any future sale or trade, I have created two usable pens, and one that I will be proud to display. The bonus is that the acquisition cost is less for both of these pens, than clean example would sell for. I guess the lesson is that if you are seriously chasing down an elusive pen for your collection and you find an imperfect example, you may want to take it home and wait for the day when another imperfect pen has a different problem, and the parts can be traded out.